Loren Michaels Harris was only 10 when his adoptive mother unexpectedly passed away, thrusting him into the Michigan foster care system. Over the next 5 years, Loren had a total of 22 mothers, if you include his birth and adoptive mother. Having survived those harrowing years, Loren now shares his story, and through that has been able to heal many of the wounds relating to his own low self-esteem and the shame of foster care. And also the wounds of other survivors as well. He specializes in working with middle school through high school youth and correctional systems. Loren shows others a tried and true method that enables even the most wounded person to discontinue wearing Scarlet Letters of shame. often self-perceived “tattoos” for the fraud they truly are and shares how he used and continues to use what were once his shamings as ladder rungs – rungs that continue to enable him to climb his way to the stars…and beyond. An Amazon #1 Bestselling author, Loren wrote, How To Get Speaking Gigs Fast!, followed by Fostering Your Message: How to grow your message for the masses, both bestsellers. He’s also authored featured articles within many national publications, most recently being featured in both Foster Focus and Adoption Today magazines. Also a recording artist, Loren’s album, “Battlefield”, includes the first anthem supporting marriage equality. His latest release on the album is “No Fences.” A portion of the proceeds benefit the Orlando Victims Project. Loren has been featured on ABC, CBS, NBC, Fox, CNN and People, to name a few. 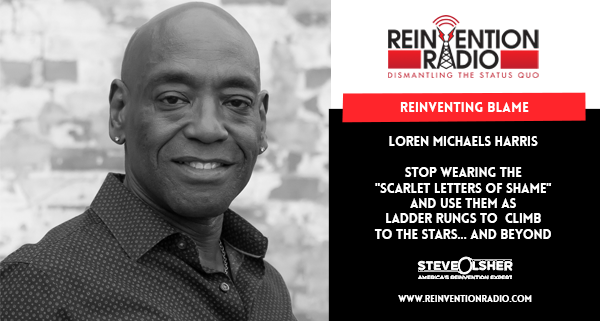 TUNE IN to this episode as Loren chats with Steve, Mary, and Richard about how to stop wearing the “Scarlet Letters of Shame” and use them as ladder rungs to climb to the stars… and beyond. Reinventing Being A Millionaire – In this episode, J V Crum III chats with Steve, Mary, and Richard about making your first million by creating a positive impact.